There is beauty in simplicity, and there is power in beauty. Introducing our powerful, simple Stroops Fit Stik Pro: your ultimate tool for building core strength, explosive power, flexibility, and endurance. 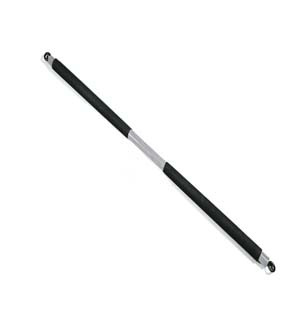 Made of steel, our lightweight, portable, scientifically engineered Fit Stik Pro consists of a 43-inch long handle with professional grade grips with swivel eyelets that attach to our patented Slastix® (one or both sides at a time), which are then anchored to a stationary object or your own feet. Deceptively simple in design, Fit Stik creates resistance while you engage in exercises and movements that mimic real-world sports. Fit Stik Pro—simple, powerful, beautiful. Includes one Fit Stik Pro, one protective foam door anchor.